Simple passkey generator and password storage utility. Is there a better alternative to Bank-Note? Is Bank-Note really the best app in Security category? Will Bank-Note work good on macOS 10.13.4? 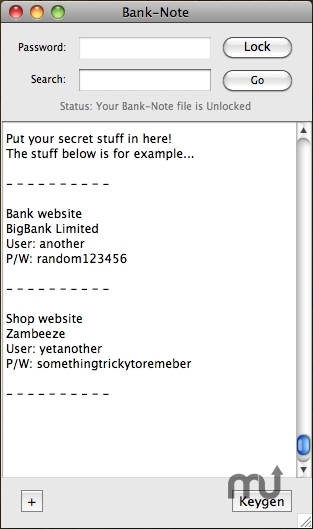 Bank-Note is designed to keep all your internet Passwords, usernames, login details, etc., in a passkey-protected, searchable, encrypted file on your computer. Using Bank-Note, you’ll be able to easily find these details when you need them, but only you will be able to access them. Bank-Note needs a review. Be the first to review this app and get the discussion started! Bank-Note needs a rating. Be the first to rate this app and get the discussion started! Bank-Note includes a built-in passkey generator which gives you a quick random passkey using 4, 6, 8, 10 or 16 numbers and letters. This is very useful when you sign up to a new site or change your password for an existing one [you do that right?]. You can generate a strong random passkey during this process and keep all of the new login details in your Bank-Note file.